Here we are again, at the end of the year, ready for some feasting, friendship and fun. Yet if visions of sugar plums make you feel guilty, you may deprive yourself rather than thrive over this holiday season. Let’s take a look back and do a recap of the diets and eating trends of the year and hopefully I will offer you some strategies that make you cheer not tear. There is a lot of food bullying , shaming and guilt encompassing everything from gluten, GMO, sugar, dairy and meat. And while many of us intentionally eliminate foods from our plate there are too many people who are in great need because they do not have enough to eat. In addition to the confusion on the plate there are too many so called nutrition experts weighing in with evidence based on the listserv not the literature. This results in unnecessary food avoidance and phobia based on opinion rather than fact. We are all entitled to eat within our salary cap, our calorie cap and be nourished with foods we enjoy, based upon our food preferences, medical needs and culinary ability. We don’t need hydrogenated or alkaline waters. Our bodies are very good at eliminating toxins without the help of a cleanse. For those who choose to be meat-less, that does not mean protein deficient. 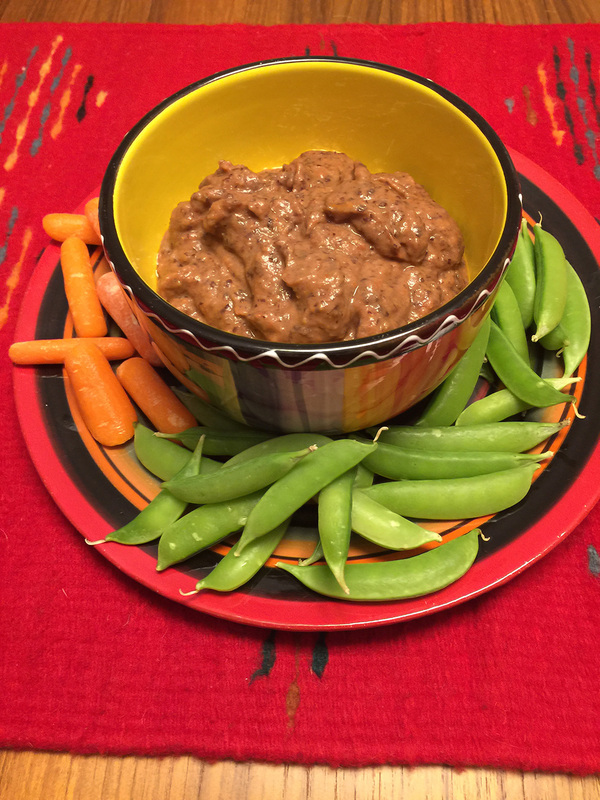 There are many palatable and affordable plant based meat alternatives that can be eaten alone or used as a base for chili, tacos, meatballs and soups. Rather than cut out grains, we can cut down and at the same time, ramp up our produce intake through the versatile and flavorful vegetable based rice and noodles, as well as cauliflower pizza crusts. Eating fruit and vegetables provides the chew and versatility that we don’t get through juicing. If you opt for a non dairy milk alternative, do be selective with your pour to ensure that you are getting more nutritionally. We all know that it is important to take care of our heart, mind our waist and move our body, but we should pay as much attention to our brain and incorporate foods such as fatty fish, berries, olive oil, nuts, beans and whole grains. Taking good care of our gut is more than planks and crunches but also consuming food sources of prebiotics, probiotics and fermented products. Add yogurt, kefir, pickles, sauerkraut, kimchi and even kombucha to your diet to support a healthy gut. It’s ok to try a food trend but the focus should be more on what you do rather than don’t eat. If you like animal protein, a vegan diet may be wise. If you enjoy carbs, the keto diet may not be one to try. Avocados are great but they are not the only type of fat that has to go on your toast, bowl or plate. Enough with body bashing, and food trashing. Let’s make peace with our plate, let’s enjoy foods that taste great and let’s make this a season to celebrate. Create an enabled table with people you love, foods that excite and memories that delight. Yes, it’s that time of the year- A new start, a new you, new habits, out with the indulgences and in with the plan. Sounds great, healthy, positive- a clean slate and a better plate, but before you delete, I want you to think a little about what you choose to eat. We all know that there are many different reasons we choose the foods we do. Familiarity, comfort, affordability, preference, and ease can sway our food choices no in January as well as December. So when we try to overlay a list of “rules” to get on a better eating path, our underlying habits and food selections may be an obstacle. So where does that leave us? Should we not try to make different food choices, change portions, eat more mindfully- of course that is fine, but why do we feel we have to choose one over the other. Can you have your cake and eat it too? Must cauliflower always be the substitute for rice or potatoes? Is sugar a bust and keto a must? You may have heard term intuitive eating which is a non-diet approach where you learn to pay attention to what you want, what you need, what you are hungry for, how much you need to eat, how you feel when you eat , gauging hunger and fullness without the need to count calories, fat, carbohydrate, or protein. If is a great approach if it works for you but some people need a road map or plan to follow until they learn how to listen to their body. I would call this into-itive eating. We all need to find our buy in to be able to try out a plan. 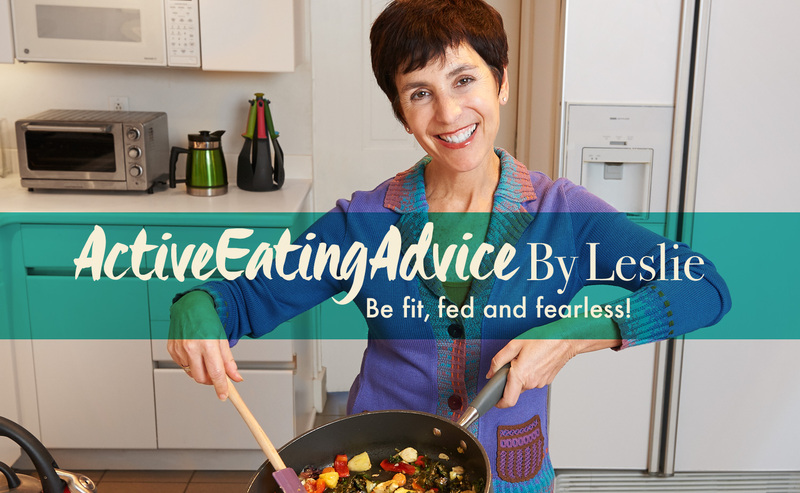 So let me propose a different way to approach eating: What could into-itive eating look like? Is there some type of protein on the plate? Chicken, eggs, beef, pork, fish, shellfish, tofu, veggie burger or beans? Is there some type of “carb on the plate?- bread, rice, potato, pasta, corn, tortilla, quinoa, cereal? Is there some produce on the plate? Fruit, salad, raw vegetables, cooked vegetables, vegetable soup? 10 items not too fancy, checks all the boxes! Work, relationships, exercise can sometimes be uncomfortable. Food is supposed to provide not only sustenance and substance but also enjoyment. A plain piece of boiled chicken with a few steamed green beans does not look or feel comfortable. A low-carb meal before exercise may leave you too fatigued to get the most out of your workout. When we are feeling down, a bowl of soup feels a lot better than a bowl of kale. Comfort food does not have to sabotage healthy eating. Sit down, de-stress, relax, take your time to nourish with foods that look, smell and taste appealing to you. An eating plan that is financially unattainable is not sustainable. Making an investment in your health means you also have to eat within your salary cap. As you consider your food choices, think about food cost, and how those foods fit into your budget. If you buy a lot of food and end up throwing it away, that is money down the drain. Certain grocery store items and specialty items are pricier than others. The goal is not be plate poor. Draft a food budget to determine how much you are willing to spend on what you eat. As you think about your food choices, consider the texture, temperature and flavor profile. Some of you may be into spicy, crunchy, savory foods while others prefer less seasoned items. There is not right or wrong, but if your meal choices or the “diet” recommendations are primarily composed of foods you don’t like, you will not be likely to follow the plan long term. Your taste buds need to be part of the selection process. Think about foods you normally gravitate towards to help you identify your preferences. Even though eating is something we have to do, many of us don’t want to worry about the shopping, preparation and clean up. Your into-itive eating plan may be convenience, grab and go, frozen meals or smoothies. Can you still nourish your body well even if you don’t like to cook? Grocery stores sell prepared foods, many restaurants offer the ability to customize offerings and portions. Strategize, individualize and personalize your eating to get into-it to be more likely to do it and stick with it in 2019. I am a Pittsburgh girl and pierogis and if you live in this city, you love pierogies. Hey, we are the only MLB team that has pierogis that run the bases! 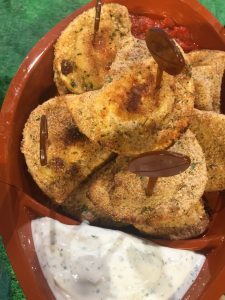 So to gear up for National Pierogi day on October 8th, why not try some of Mrs. T’s pierogi recipes. I prepared the following three recipes and I have to say they were a home run, touchdown and GOALLLLL! The first is Buffalo Pierogies. Sure, everyone loves Buffalo wings, but they are often deep fried and very high in saturated fat. So, why not prepare Pierogies with the same flavor? Preheat oven to 400 degrees. Combine melted butter, Buffalo wing sauce, and chili powder and toss with pierogies. Bake for 16-18 minutes, or until pierogies are browned, For best results, turn over halfway through baking. Serve with dip and carrot and celery sticks for 1 stop shopping: carbs, protein and produce on your plate! 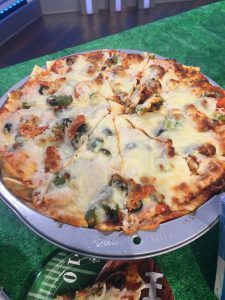 Instead of the same old pizza, how about a new twist? Pierogies as the base topped with your favorite pizza toppings. The new Five Cheese Pizza pierogies provide a flavor to savor. I love that this recipe is so easy, so tasty not heavy and not greasy! Chopped green peppers, mushrooms. Sliced olives, and onions. Spread pizza sauce over the pierogies to cover. Top with peppers, onions, mushrooms, sliced olives and turkey pepperoni. Sprinkle with cheese. Bake 12-15 minutes or until cheese is melted and pieorgies are heated through. 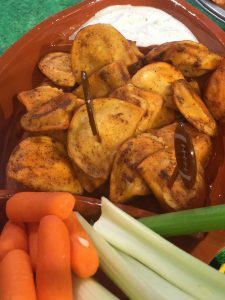 Cut into wedges to serve. Certainly pierogies sautéed in butter are just heavenly, but if you are looking to lighten up without sacrificing taste, this recipe is for you. Marinara sauce and ranch dressing. Preheat ovent to 425 degrees. Grease a cookie sheet with non stick cooking spray. Set aside. In a large bowl, combine breadcrumbs, parsley, basil, garlic powder, paprika, salt and pepper. In another bowl, beat the eggs. One by one, coat each pierogi with egg, and then in the breadcrumbs. Make sure they are fully coated. Lay pierogies flat on the greased baking sheet. Serve with marinara sauce and a light Ranch dip made with plain Greek yogurt and ranch dressing dip mix. If you are a football fan, you know that sometimes your team makes you cheer or end up in tears. But you can always score with your pour. POM wonderful delivers the perfect combo of sweet and tart as well as health benefits, to give your body a smart start. Pomegranates are high in antioxidants to help fight off disease and keep the body healthy. Pomegranate juice is a good source of potassium, a mineral that most of us fall short on every day. Plus there is no added sugar making POM Wonderful a better choice than sugar sweetened beverages. 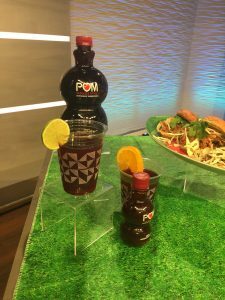 Fill a glass halfway with POM Wonderful’s 100% pomegranate juice and then fill the rest of the way with a lime or orange seltzer water. Squeeze in a little fresh lime or orange and enjoy. Cheers! IF BBQ is on your menu, try these chicken sliders that use POM Wonderful 100% Pomegranate juice in the marinade. Heat the oil in a large nonstick skillet over medium heat. Add the chicken and onion and sauté until both are golden brown, about 8 minutes. Add the pomegranate juice, chili powder, salt, and pepper, cover and cook over medium heat until the chicken is well-done, about 10 minutes. Remove pan from the heat. Transfer the chicken to a cutting board and slice thinly. Return the chicken to the pan and cook with the onion and juices for another 3 minutes until the juice is absorbed. Place a spoonful of chicken on ½ of the bun, top with coleslaw mix and cilantro. Get on the Right Track with Your Snack! Oh what a wonderful morning, afternoon or evening when Wonderful Pistachios are in the house. Full of healthy mono and polyunsaturated fats as well as protein and fiber make them a nutrition powerhouse that deliver on health and flavor. Plus., they make keep you fuller longer than other snacks and 49 pistachios is a nice serving size. As an added bonus pistachios in the shell mean you have to work harder to crack your snack! I love them as they are, But also in recipes. Here are two recipes with pistachios, a pesto and hummus. 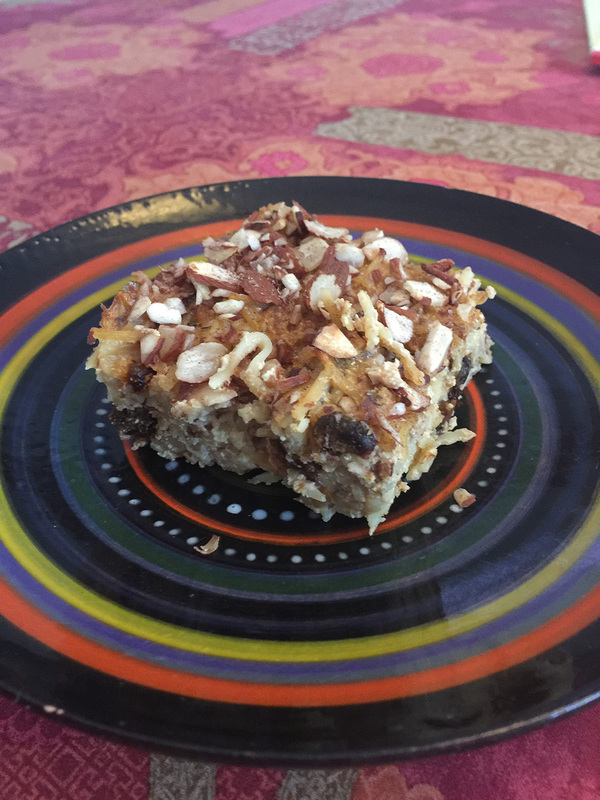 Pistachios replace the pine nuts and the lemon adds a lovely flavor to this delicious dish. Add Wonderful pistachios. Basil, garlic, lemon juice, zest and Parmesan cheese to a food processor. Pulse until the nuts are finely chopped. Stream olive oil through the food chute and puree until smooth. Boil 4 quarts of water and add a box of pasta shells. Cook until done. 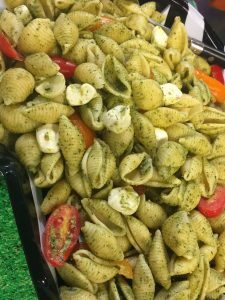 Drain and toss with ¾ of the pesto. Add sliced grape tomatoes and mozzarella pearls. Instead of the tahini, ground pistachios add a lovely nutty flavor to hummus. In a food processor, blend together the pistachios and olive oil until smooth, add garbanzo beans with half of the liquid and the garlic. Add lemon juice, salt, pepper, paprika and cayenne. Blend until smooth. When we hear the word “snack” we think fast, indulgent, delicious but not necessarily nutritious. The beauty of dairy is the versatility, simplicity and delivery of nutritional pow with a taste that wows. When time is short and hunger levels are high, dairy can be your go to and go with. Dairy foods are a complement to fruits, vegetables and whole grains to take snacking from ho hum to yum! Dairy snacks are tasty, versatile, easy and budget friendly. Dairy is all about simplicity. A short list of ingredients that are long on flavor and nutritional benefits. Milk provides 9 essential nutrients, Yogurt provides 7 essential nutrients and cheese provides 6 essential nutrients that help your snacks to nutritionally stack up. Dairy foods are ready to eat. 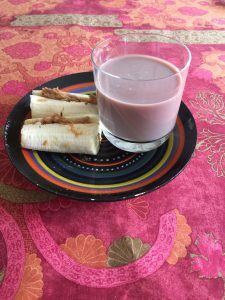 They are great stand alone or combined with other foods such as a glass of low-fat chocolate milk and a banana with peanut butter. Slice a small banana in half lengthwise and then cut each slice in half to have four pieces. Spread 1 Tablespoon peanut over the 4 pieces. Press 2 pieces together for a banana sandwich. Plain low-fat Greek yogurt flavored with taco seasoning, onion soup mix or vegetable soup mix makes a high protein dip. Cottage cheese can be enjoyed as is, combined with fruit, or mixed with salsa. Cheese pairs beautifully with fruit, works as a tortilla topper or adds the show stopping topping to mini pizzas. Dairy foods are a great source of protein, which helps to make us feel fuller for longer. Many snack foods can be long on carbs but short on protein. A small dish of cottage cheese with applesauce and cereal is an easy protein–rich snack parfait. Yogurt is a ready to eat treat and an easy snack, but for a hack try plain Greek yogurt and add your own seasonings to taste such as cumin, chili powder, dill , garlic or onion powder and a little salt and use as a dip for bean chips and vegetables. Mix together and serve with cut up vegetables. If you want to use chips. Keep the portion to 1 ounce of chips. Dairy adds the creaminess and texture to a recipe. 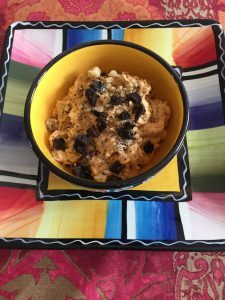 Oatmeal is not just a breakfast food, but is wonderful as a snack, and when combined with low fat vanilla Greek yogurt and pumpkin makes for a satisfying and tasty snack. Mix together oats, pumpkin, yogurt, spice, and maple syrup. Eat right away or refrigerate and eat later. 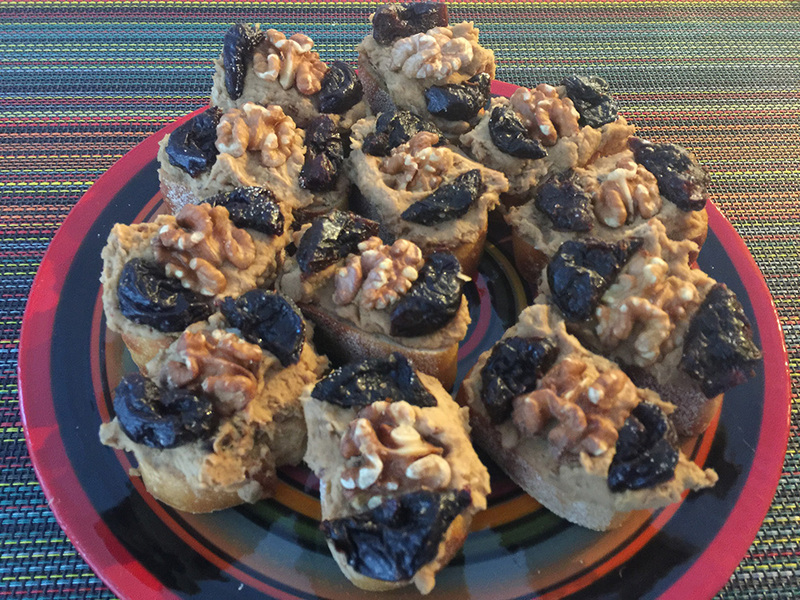 When ready to eat, top with prunes and walnuts. The versatility of milk is that it can be consumed in a glass, or added to smoothies with fruit, or in a bowl of cereal for a quick snack that keeps your nutrition on track. Cheese is a food that some people may limit due to the calories and fat. The good news is that there are several varieties of lower-fat cheese, but also several forms of full fat cheese to cut the fat and calories. 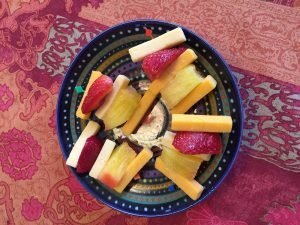 Try cheese and fruit kebabs for a savory and sweet snack option. Alternate cubes of cheese with sliced fruit on toothpicks. How about a mini caprese snack pizza? 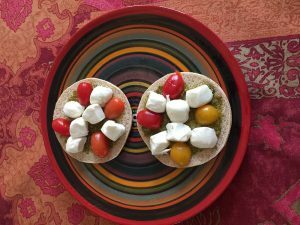 Mini fresh mozzarella balls with tomato on a whole wheat sandwich thins with pesto makes for a delicious and satisfying snack. Open the sandwich thin and lay flat. Spoon and spread ¾ teaspoon pesto on each half. Arrange slices of tomato and fresh mozzarella. Cheese can add the protein to salsa. Mix ¼ cup shredded low-fat Cheddar in ½ cup salsa and serve with vegetables for a flavor-rich, nutrient dense snack. Dairy can be a great way to reuse, repurpose and renew your snacks. Add the leftover cereal crumbs to cottage cheese or yogurt. Use up that brown banana by mixing with milk in a smoothie. Sprinkle the last of the cheese onto a tortilla and top with salsa. Turn leftover oats into something dreamy by adding a little bit of creamy Greek yogurt. Dairy ups your nutrition score in your pour, bowl or on your plate with variety, satiety and a taste that is just great! For more simple dairy snacks and inspiration, check out UndeniablyDairy.org. This post is created by Leslie Bonci, registered dietitian as part of the Undeniably Dairy campaign, sponsored by the Innovation Center for US Dairy and America’s Dairy Farm Families and Importers. I would like to express my gratitude to the farmers and processors who make sure that their dairy products deliver on quality, consistency, and simplicity. Boil 3 cups of fine noodles, dry in 2 quarts boiling water for 3-4 minutes or until done. Drain and set aside. In a blender or food processor, blend the eggs, Greek yogurt, Cottage cheese, prune puree, melted butter, ¼ cup sugar, vanilla and milk until smooth. Stir in the prune pieces. Stir the noodles into the egg mixture and pour into a buttered 9 x 13 pan. Sprinkle on the almond topping. Bake for 30 minutes or until a toothpick inserted in the center comes out clean. 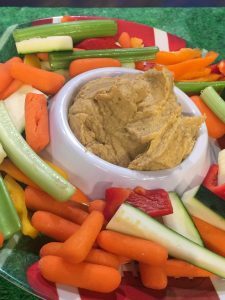 For an easy, tasty, nutrient filled alternative to high fat dips, give this one a try. Not only does it deliver on flavor, but you get a double dose of veggies with the beans and salsa as well as double protein from the Greek yogurt and the beans. 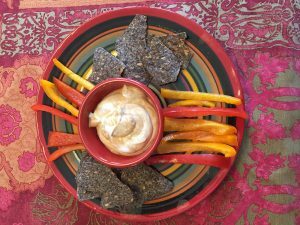 And if you use bean chips and/or veggies for dippers you are an A-lister when it comes to eating well.